This Site is about Computer tips, Security, Hacking stuffs.. And much more... If you don't want to Compromise with your Security than you are at Right Place. Disclaimer:- I'm not responsible for any damage done by the contents provided in this blog these are only for your learning Purpose.. When u wants to hack then, the first stage is, of course is collecting information about the victim. This stage mainly starts with to finding IP Address of the victim, so that you can continue next steps to hack. To finding IP Address you used software’s like Port scanning, NetBIOS, …etc. 1. Go to IP Address Finder website to find someone's IP Address. 2. Enter your email id where you want to receive the victim's IP Address and hit on Get Link. 3. Now, you will get a link from IP Address Finder. 4. Send this link to your victim and whenever he will simply click on this sent link, his IP Address will be recorded and mailed to you by IP Address Finder. Thus, this is so simple. 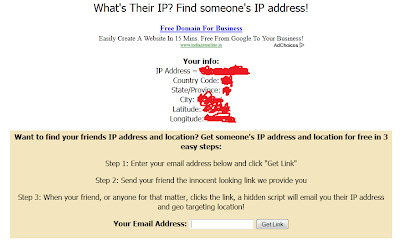 You can easily find someone's IP Address using this IP Address Finder tool. So far, this is the simplest method used to find someone's IP Address. This IP hack doesn't require any technical knowledge or any skills. Got problems with this Free IP Address Finder tool??? Unable to find someone's IP Address using this IP hack??? Share your reactions in comments. I am always there to help you. Note: This is illegal and is for educational purpose only. Any loss/damage happening will not be in any way our responsibility. If u like then plz follow my blog & also help to promote. Don’t forget to leave comment. HACK IP ADDRESS OF ANOTHER COMPUTER. HOW TO ACCESS BLOCKED WEBSITES. Copyright © 2015 Hackers Life. Awesome Inc. theme. Powered by Blogger.